Killer7 was released on the Gamecube in June of 2005 after several delays. The game, published by Capcom, was a part of a series of games known as the Capcom 5. The Capcom 5 was a set of five high-profile games originally meant to be Gamecube exclusives, although this did not last for long. The other four games in the Capcom 5 were P.N.03, Viewtiful Joe, Dead Phoenix, and Resident Evil 4. Only four of these games were actually released, as Dead Phoenix was quickly abandoned by Capcom, and only P.N. 03 remained a Gamecube exclusive because it was terrible. 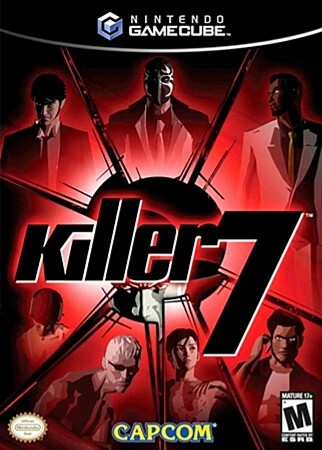 Killer7 was released on the PS2 a month after the original release. Killer7 gained a lot of attention for having a very unique look, strange setting, and for being a mature title on a Nintendo console. The game received very mixed reviews with some praising it as a breath of fresh air, while others criticized it for its strange gameplay and hard to follow story. It currently holds a 74 on metacritic with an 8.4 from users. Killer7 follows Garcian Smith, leader of an assassin guild charged with eliminating the mysterious creatures known as Heaven's Smile. There's no easy way to summarize this story, so the only other thing I can say is that politics is involved. The game was the first big title designed by Suda51. After General Ironicus and myself LP'd Suda51's more recent No More Heroes, we felt it only made sense to move on to this game. The videos are as streamlined as possible with backtracking cut out, dialogue boxes are added to help the slow talking ghosts move by more quickly, and most menu navigating is reduced to pop up bubbles to notify upgrades have been purchased without slowing down the pace of the game. Commentary is done by myself and General Ironicus. I know what's going on as well as a mortal man can, and he knows nothing unitl it shows up on-screen. He has pledged to avoid spoilers "as if every spoiler I read prevents one of the 108 lost episodes from ever being found".